Our on-demand grading service helps students receive high-quality feedback on their essays faster and lightens the grading load for teachers. My mom’s a teacher, so I love that we can give teachers more time for all of their other important responsibilities without sacrificing great feedback. Two weeks ago I spent a couple of hours hunched over a cafeteria table, helping one of the eighth grade students I mentor outline her research paper. It brought back some fond memories of my time as a high school English teacher. But it also reminded me of one of the most frustrating aspects of teaching writing: When you’re a full-time educator teaching dozens of students, there is never enough time to provide every single student with the kind of detailed and consistent feedback that will truly transform their writing. Better Writing Grades: That’s what The Graide Network wants to accomplish, and has raised $1 million in a seed round led by Network Ventures to do so. The Chicago-based company uses a network of remote teaching assistants to help improve K-12 students’ writing and critical thinking skills. This piece is a part of Camelback's Ruthless for Good series, sharing different ways that individuals embody the spirit of our manifesto and what they fight for. Once a year, Built in Chicago hand-selects startups that have the vision, team, focus and funding to drive innovation within the tech community. For our 50 Startups to Watch in 2018 list, we chose local companies founded within the past five years that we believe have positioned themselves for rapid growth and scaling in the year to come. "We know how important it is that kids get feedback on their work, yet that was the ball that kept dropping." Based on surveys, the Graide Network reports that teachers using the service spent 88 percent less time on grading, allowing them to provide one-on-one help for struggling students. The students appreciated it, too. One teacher reported that "getting the comments was like Christmas for my students." Applicable to practically any academic field or professional focus, learning how to write well can be one of the most valuable takeaways from a K-12 education. But becoming a good writer requires lots of practice and in-depth feedback, which can be hard for time-strapped teachers to provide. The Graide Network wants to help teachers provide that additional follow-up for their students. Ten education startups took the stage at SXSWedu 2017 yesterday to pitch their early-stage companies to a jury of education experts and live audience. We are thrilled to announce that Teachers Connect, The Graide Network and The Whether powered by Better Weekdays have been selected to advance to the final round of the competition. 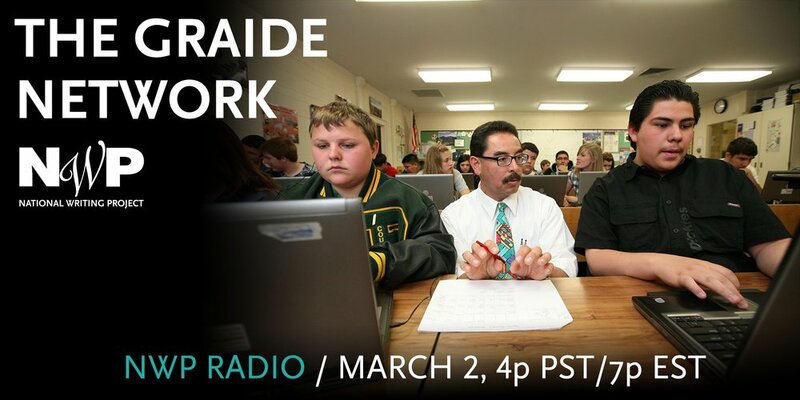 Listen as The National Writing Project hosts a wide-ranging discussion of the power of The Graide Network as an instructional tool, the importance of effective feedback, and the value of experiential learning for pre-service teachers. Featuring Brophy College Prep English department chair John Damaso and all-star Graider from University of Illinois-Chicago Sumaiya Qazi. At the Kellogg-sponsored Social Innovation and Entrepreneurship Inspiration Days in 2014, Blair Mlnarik Pircon ’16 MBA listened to a former classroom teacher lament that he had been unable to provide nearly as much feedback to his students as he would have liked. The idea for the Graide Network was born: use applications of the sharing economy and readily available remote working tools to share student work with vetted graders — undergraduate, graduate and doctoral students who are aspiring teachers — who provide personalized feedback to students. Businesses that strive to solve education-related problems are in a league of their own. They're working to improve a flawed, labyrinthian system, and, in doing so, they contribute to the betterment of society while investing in the hope for a better future. SXSWedu showcases innovations in education with a fast-paced, live startup competition. Ten early-stage education startups have been selected as finalists to participate in the sixth annual Launch event. ...most entrepreneurs were white and male. But in a space as diverse as public education, where K-12 students are 50 percent female and students of color comprise a larger percentage of the population than white students, there’s a fundamental disconnect between creators and users. The statistics around entrepreneurs creating the tools and the statistics around public school students consuming the tools don’t match up. Enter Camelback Ventures, a three-year old “incubator” specifically designed to brew entrepreneurial talent amongst women and people of color—geared predominantly towards entrepreneurs in education. Blair Pircon joined Steve on The Opening Bell to talk about her company that is giving teachers a much needed breath of fresh air. “NUVC not only showcases the tremendous talent of Northwestern students but also the diversity of entrepreneurial endeavors on campus,” said Melissa Crounse, executive director of The Garage, the University’s new innovation incubator. By the numbers, this year’s class could be a case study in diversity. Some 57 of the 100 members were women – a milestone considering how women traditionally represent a third of their MBA classes. They hail from 53 different MBA programs globally, representing nearly every school in Poets&Quants’ Top 25 American and Top 10 International business programs. It’s no surprise that the panelists all agreed that on-demand labor scales well. However, many have found that the marketplace model also means better economics and service. 1871 announced a second group of women founders to participate in WiSTEM, a program for early-stage technology or technology-enabled companies. “We have a stellar group of women,” said Nicole Yeary ⇒, founder of Ms. Tech and co-facilitator of WiSTEM. The Graide Network was selected the winner of the pitchfest through an audience vote. The companies were selected through open applications and were selected because they “could have the most impact on education, on students, on helping to advance teaching in and out of the classroom,” said Lockett.